Periodontal disease, or periodontitis, is an infection of the supporting tissues of your teeth. This includes both the hard and soft tissue, or the bone and the gums. Because periodontal disease is painless, you may not know you have it. Periodontitis is caused by plaque, which is the sticky film of bacteria that forms on your teeth. There are different types of periodontal disease, but the two most common are gum disease (gingivitis) and periodontal disease (periodontitis). Gingivitis is the earliest stage of periodontitis and only involves the gums. It is curable with proper home care (brushing and flossing). Typically teenagers and young adults are the most commonly affected. The symptoms of gum disease are red, swollen and bleeding gums. If left untreated, gingivitis can lead to periodontitis. Periodontal disease is a chronic condition that can lead to loss of the tissue and bone that support the teeth. Without proper support, the teeth will become loose and potentially have to be removed. The precursor to periodontal disease is always gingivitis. 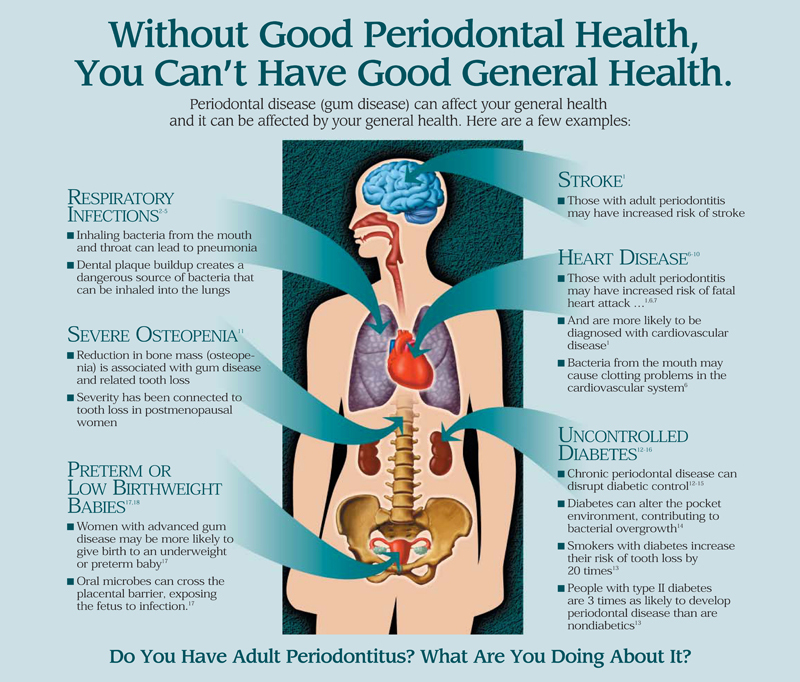 The symptoms of perio disease are loose teeth, bad breath and loss of gum tissue around the teeth. Periodontitis is the leading cause of adult tooth loss. Treatment for periodontal disease is determined by the type. In order to keep the disease from progressing, daily brushing and flossing and professional cleanings are necessary. When the sticky plaque is not continually removed, bacteria will form and it will turn in to a hard deposit called tartar, or calculus. Tartar can only be removed by a professional. Treatment for periodontal disease varies. A regular professional cleaning may be all you need to treat your periodontal disease (if it falls in the gingivitis category). If your disease is more serious, you may need a deep cleaning (scaling and root planing) or even surgery. Good oral hygiene – Flossing, Brushing and regular professional cleanings are the best agents to prevent periodontal disease. Bruxism: Teeth Grinding and Jaw Clenching What to do for a broken or knocked out tooth?